Practice Artificial Intelligence questions and answers for interviews, campus placements, online tests, aptitude tests, quizzes and competitive exams. This set of Artificial Intelligence Multiple Choice Questions & Answers (MCQs) focuses on “Miscellaneous”. 1. Output segments of AI programming contain? 2. In LISP, the square root of X is referenced as? 3. How can you evaluate 1.25 + sqrt (144) in LISP? 4. When a top-level function is entered, the LISP processor does? 5. Which kind of planning consists of successive representations of different levels of plan? 6. The component of an ICAI (Intelligent Computer Assisted Instruction) presenting information to the student is the? 8. The hardware feature of LISP machines generally include? 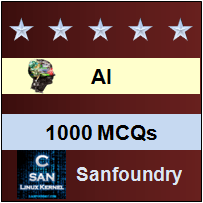 Sanfoundry Global Education & Learning Series – Artificial Intelligence. To practice all areas of Artificial Intelligence, here is complete set of 1000+ Multiple Choice Questions and Answers on Artificial Intelligence.